I'm sort of obessed with Hydrangeas. Anyone who comes in my yard will see that I have quite a few different varieties of these lovely shrubs. The very first ones I purchased were two 'Endless Summer' beauties that I put in the front of the house. Unfortunately, they got way too much sun and were very sad, so I moved them to a location mostly shaded by our neighbor's garage...they also grew a lot from that first summer! Nooooooo!!!! I had to come up with a solution that didn't involve moving it again, so I temporarily made a little 'Hydrangea Hut' to shade the hottie on the right. It was made out of a cardboard plant tray and tall bamboo stakes. It was so silly looking! I'm hoping to put up a small arbor over both of the hydrangeas next summer to shade them. Until then, the basket works okay. My other hydrangea baby is the lovely Annabelle on the opposite side of the yard. She also gets wilted in the hot afternoon sun, but definitely tolerates it better. She is only one season old, and already an impressive size! I also gave into the hype and purchased two 'Incrediball' Annabelles, but unfortunately, they don't have any flowers, and I'm also not seeing much new growth. Boo! These may be going back to the garden center next year if they don't impress me! Hopefully after I cut them down this fall, next year they will grow nice big blooms in the summer. On the patio (north) side, I have two Hydrangea vines on trellises, they get up to 60 feet long and sport delicate lace-cap flowers in the spring and early summer. Unfortunately, they love to sneak onto the brick instead of the trellis! Wouldn't that be stupid to have an empty trellis and all the vine on the garage? Yeah, that would totally happen to me. I gave to guide the growth with twistie ties so that doesn't happen. Next to the vines, I have two other lesser-known hydrangeas. This one is called 'Homigo', it is debated online whether or not it survives in our zone, but it is protected from wind and cold by the brick garage, so it is thriving here! I love the huge, strong-petaled blooms. The other guy over here is called 'Preziosa' and it is truly special. Again, it's only supposed to be hardy to zone 6, but with winter protection it can also do well in zone 5. What I love about these shrubs is that when they are in a good spot, they are mostly carefree plants. Too much hot sun, and they will wilt - but if they get morning sun and not much else, they will be totally happy with a daily sprinkle. I don't use fertilizers, because some hydrangeas are sensitive to them. 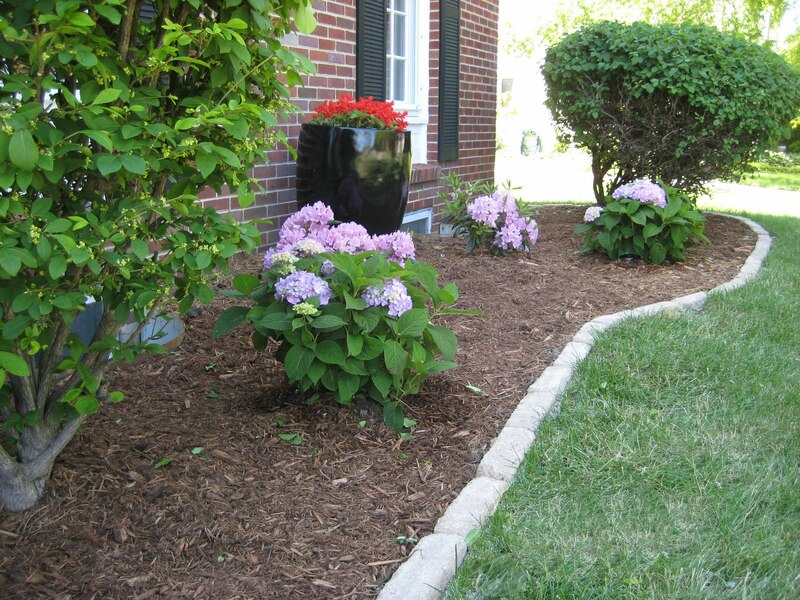 Fertilizers also tend to encourage foliage to grow, while discouraging blooms. I use Aluminum Sulfate on the endless summers to change them to blue, but the rest of them are eu natural and don't get any chemical help from me. As far as cutting down, I don't cut the endless summer until spring. Annabelles always bloom on new wood, so you can cut them down to the ground whenever you want before growth starts. I will definitely be cutting mine down hard, under a foot from the ground to encourage stronger stems. For the Homigo and Preziosa, I leave the old wood over the winter for added protection, and also put up burlap around them on stakes to shield the wind. Worked like a charm! The old wood can be cut before growth starts, as they both bloom on new wood....this is not what the internet said, by the way! Is anyone else as obsessed as I am?? I LOVE the blue ones. I have two old beauties, a vine and just bought two more bushes this year...they are waiting to bloom though. Such a great bush! Yes! I am obsessed with hydrangeas too... but sadly, we don't have any! Well, we have one, but it doesn't really count. We hope to do a big overhaul on our yard next year, and our plans are to include tons of hydrangeas! Yours are beautiful! We got 2 endless summers this year. I will NOT be showing you what they look like currently lol. I'm hoping they really just take root and establish and I'll hope for pretty blooms like yours next year. If they do well I'm hoping to get more! I love hydrangeas, but I killed mine (too much sun) 3 years ago and haven't planted any since. I cut them from my mom's garden and bring them into our house all the time. I can't believe the garden center planned my landscape and suggested hydrangeas in this full sun area.. boo! So pretty! I just got our first hydrangea - a limelight grafted tree. I love it and was so excited to see blooms this year since I'd heard they sometimes take two summers to bloom after being moved. OMG Yes! I totally love hydrangeas. I am dying to plant some but hubby doesn't quite feel the same. I think they would look perfect with our house. I might get some now while they are on sale so they can establish roots and hopefully bloom next year. Yours are gorgeous. I had no idea there were so many different kinds. Thanks for sharing. Love them and yours are gorgeous! Our neighborhood is full of beautiful and HUGE hydrangeas so I followed suit this year and planted two of them. I'm hoping they do really well next year...they've already bloomed and dried for this year. I love hydrangeas.... currently I don't have any in my yard. I don't have a green thumb and I worry they wouldn't make it! Your yard looks so beautiful! Love, love, love hydrangeas but only have 2. Don't remember what kind the older one is, but the 2nd one is an Endless Summer I got last year for Mother's Day & it's still tiny. My older one has bloomed better this year than ever before. I love having blooms in a vase on my windowsill everyday. I love hydrangeas too! They were always my mom's favorites, so we had them at my house when I was a kid. Now I love them, mostly because they're my mommies favorites! Good luck with yours - they seem to be doing well! Just for you, I took pictures from my window. Here's one angle and here's the other. I love hydrangeas but mine too have always succumbed to the oppressive heat. In South Florida, hydrangeas are a deep fried specialty, unfortunately. They're a delicate little potted treat that you keep indoors and apologize to profusely. Oh, and I loved the little sunshade you made! I love hydrangeas but can't grow them for nothing down here. I just adore them...they are the perfect flower for any occasion. makes me sad! I'm right there with you on this obsession. They are gorgeous. HA! I love your hanging basket over the wilting hydrangea. It's official...I have hydrangea envy. They are one of my favorite flowers but the majority of mine are struggling this year. I love your shade structure! LOVE hydrangeas! My mom has some by the front door, in front of the kitchen window. She had to cut them down last year cause they were starting to block the window, and they only have a few blooms this year. She said they usually don't have any at all when they get cut down, so we're happy with what we have. They're so beautiful! Don't give up on your Incrediballs yet! I planted one earlier this year and bloomed profusely, stood up the severe weather we've been having, and had bigger blooms (and more of them) than my neighbors Annabelles. We are a zone 4 over here but you should be a zone 5 according to USDA zone finders. Zone 5 opens up a whole new world. Those zone 5 hydrangeas are beautiful! I was also a June bride and used hydrangeas, my absolute favorite flower. Mine were about $10 a stem, but the flowers are so big and beautiful that you only need three or four for a big bouquet. However, when the wedding coordinator at my church saw that the blue hydrangeas I had ordered from the florist for my bouquet turned out to be pale blue, almost white, she cut me a new bouquet of bold blue ones from her mother's yard. During the vows, my husband said he saw a fire ant crawl up out of the flowers! Glad it didn't bite me! My hydrangea bushes seem to have stopped blooming already here in the South. I hope yours are still going, Sara. I am so impressed with your shade efforts. You are not alone!!!!! I'am beyond obsessed with them too. I am so impressed with your gardening skillz... your hydrangeas are beautiful! I love them too. Yours are so pretty! I had to laugh at the little canopy you made, its true, what do they want? A perfect spot I guess. I tried two in the front facing east and they couldn't handle it so they went in back under a big red bud tree and now no blooms! I will be moving them again in the spring. Love them! We only have one hydrangea bush I planted a few years ago. I have some plans for some more. So pretty! Too bad I murdered mine. But you inspire me to try again! You and your gorgeous yard! Yes, I love anything blue, hydrangea being one of my favourites. 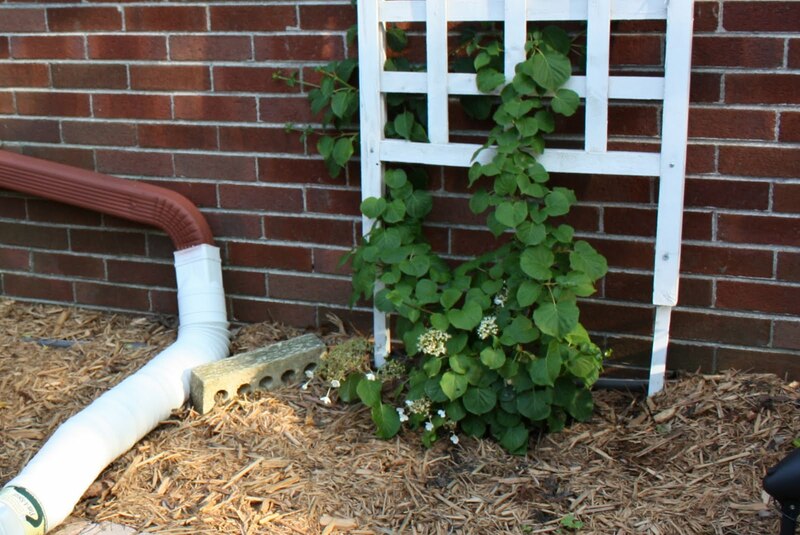 I have 2 climbing hydrangeas and they don't need support; they just climb up the brick wall on their own. They are gorgeous! Love the descriptions of your 'babies', I can tell how much you really love them! I adore all of those hydrangeas! They make your yard look like an absolute paradise. Fabulous job! I love that you have anthropomorphized your plants and the hydrangea hut is soo sweet.